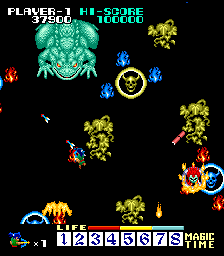 Capcom’s 1985 release Commando basically defined the overhead run-and-gun arcade genre, with many other similar games (particularly Ikari Warriors) also re-using its military jungle theme. 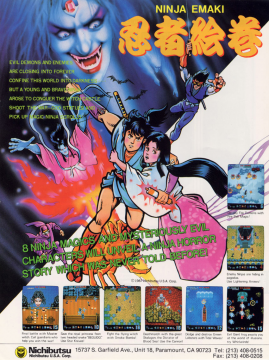 Yet before this stereotype was codified, some of its competitors opted for different themes, like Sega’s Ninja Princess and Taito’s Kiki Kaikai. Nichibutsu (of Terra Cresta fame) made a few attempts at the genre, including Soldier Girl Amazon (which is a more typical clone, though starring a sword-wielding female warrior), the goofily named (but otherwise pretty standard) Mighty Guy, and the slightly more ambitious Ninja Emaki, which features a ninja warrior fighting demons in a feudal Japan setting. (An “emaki” is a picture scroll. 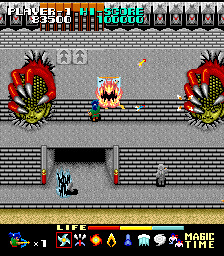 The Japanese title, Youma Ninpou Chou, means “Demon Ninja Power Book” – like Ninja Gaiden/Ninja Ryukenden, it seems like a case of replacing a Japanese title with a very slightly more pronounceable one, though still halfway inscrutable to English speakers.) 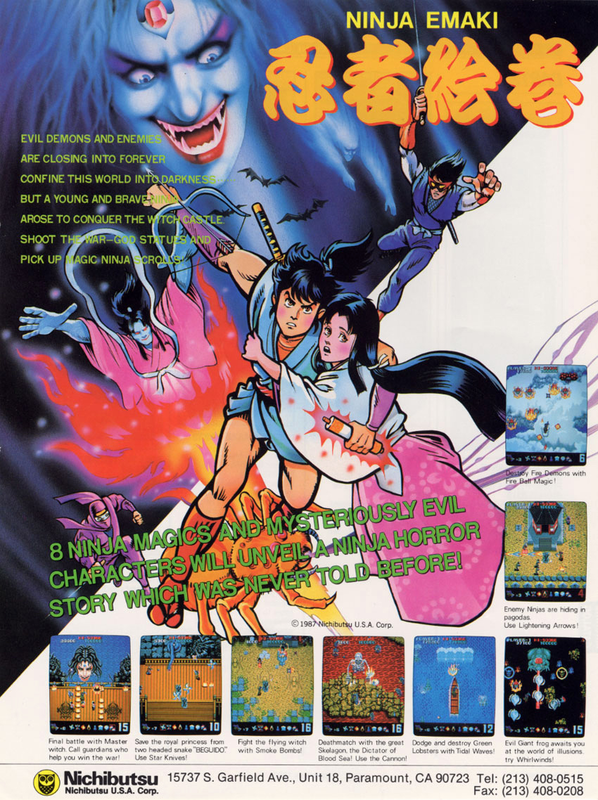 The fantasy setting was loosely inspired by the 1983 Japanese film Legend of the Eight Samurai. 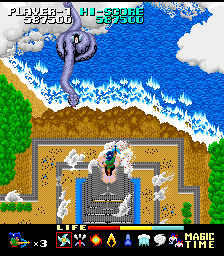 The first level is actually a vertically scrolling shooter, as the hero takes to the skies on a cloud to hunt down the main villain, who has taken the form of a flying snake. 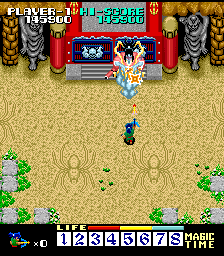 However, once this segment is over, he spends most of the rest of the game on foot, as he scrambles to hunt down his foe and save the kidnapped princess. 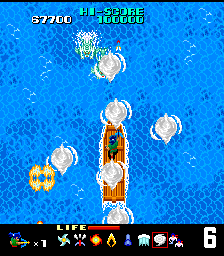 (There’s also another brief scrolling sequence midway through the game that takes place on a raft.) Though it uses a vertically oriented monitor, the levels do scroll left-and-right, occasionally requiring running around obstacles to find the main path through the level, though it’s still ultimately pretty straightforward. 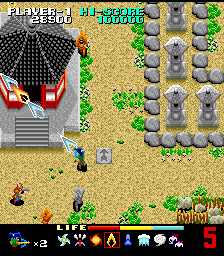 Stages include graveyards, castles, and shrines, the kind typical of games with the “magic ninja warrior in feudal Japan” setting. 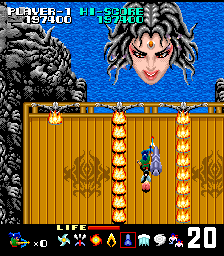 Enemies include variety of demons, like giant frogs and skeletons, with the final boss taking the form of a gigantic woman’s head. The visuals are colorful if not exactly distinctive, and the music is catchy too. 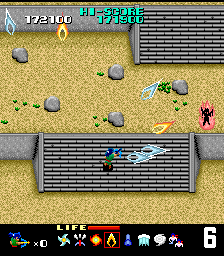 By default, your ninja guy shoots enemies with a crossbow, though the game uses an extremely generous power-up subsystem. When you grab a scroll, you have access to eight different ninja powers, with unlimited use, for twenty seconds. These are all fairly powerful – including multi-directional shurikens, smoke bombs, arrows that can attack at much more versatile angles than your main weapon, plus spells that summon tsunami waves, rotating fireballs, or little tornadoes. There’s also a shadow duplicate ability, plus the ability to arm yourself with a powerful cannon, that sits at your side and rolls along with you. While enemies appearances and attacks are constant, these powers make it much easier to stand up against them. 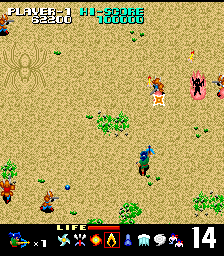 The fact that they’re so immediately accessible, instead of having to climb up through a chain of power-ups, makes the hero much more powerful than a typical arcade action game. There’s some substantial difficulty changes between the regions. In the Japanese release, you die in a single hit, unless you have a power scroll, in which case you absorb it and lose its abilities. 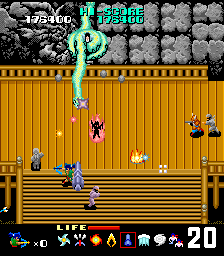 The American/World release is much easier – it gives you a life bar that lets you take three hits, while granting an extension whenever you pick up a ninja scroll, plus it lets you keep using them even when taking damage. Dying sends you back to a checkpoint, but you rarely lose too much ground, and scrolls are generously found lying around anyway. The American version also gets the benefit of a much cooler looking title screen. The stages are all fairly short and lead directly into the next without any type of pause. Some levels have bosses, some don’t, as they’re distributed unevenly. These are the only legitimately tough parts of the game, considering they require focusing on attacking one singular spot while avoiding all of the enemies and their projectiles. 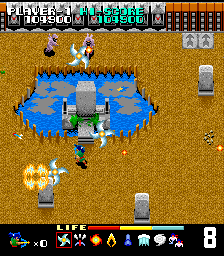 Otherwise, the onslaught of enemies during the levels is rarely too overwhelming, especially given the generous supply of special weapons. 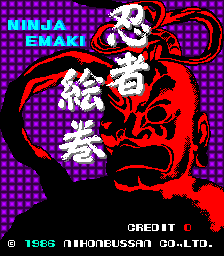 The only real sore spot of Ninja Emaki is that it’s way too short. 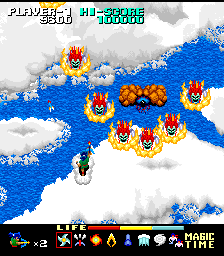 The fast pacing is one of the game’s biggest strengths, but all of the levels can be seen in maybe fifteen minutes, especially given the moderate difficulty of the English release. 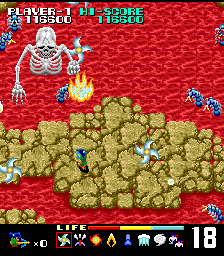 After the final encounter, the enemy just gets away and then continues onto the next loop without so much as a congratulations. In spite of that, it’s an exciting, well put together run-and-gun, whose obscurity mostly lies with its smaller developer and lack of a home port.